It was the beginning of summer 2010, I had the blog for slightly more than one year and I was stuck in a daily job where gratifications were meagre. I was still at home with my parents and my family was renting the house where I live now for the holidays. A nice American couple who was spending the week here in the countryside asked me if I could refer them to someone for a cooking class. I’m always slow to recognize opportunities, they often pass by like high speed trains, but that day, that day I caught my train. I offered myself as cooking class instructor, boasting an experience and a self-confidence I did not have. We agreed for a day and a menu and as soon as I got back home after work I knocked on their door, bringing a bag of ingredients and trying to hide my quivering voice. There was tiramisu on the menu, something I was pretty confident about, a family recipe which I could make with a hand tied behind my back. The main course was instead the result of too much enthusiasm and not enough thinking. I opted for gnudi, known also as malfatti, delicate ricotta and spinach dumplings which I had probably made a couple of times in my whole life. There’s a crucial moment when making gnudi. You pop them into a pot of boiling water and wait faithfully for them to float to the top. 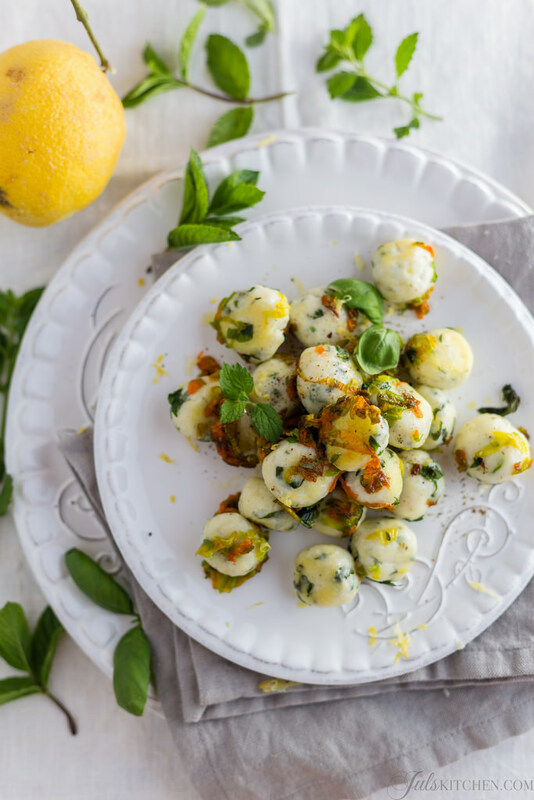 A couple of minutes separates you from perfectly shaped gnudi or from a mushy mass of ricotta and spinach. I was gazing at the pot of boiling water for any sign of failure of success: that wait had the taste of eternity. I was wondering why on earth I had chosen gnudi while I could have easily made tagliatelle when I saw the first, plump and round gnudo floating gently to the top. Soon after an army of gnudi crowded the surface of the pot. I had succeeded in preparing the first meal during a cooking class. After dinner, I walked back home with my heart fluttering in my chest. It was the first time my work had been sincerely appreciated, I felt invincible, I had found my place in the world, my mission, the job I wanted to make. One year and a half had to pass before I could call it my job and my life, many failures, closed doors and disillusionments. But that gnudi, gently floating to the top, the proof of my success, were a constant reminder that I could make it. Fast forward eight years, I’m still thanking that hazardous decision that made me choose gnudi. I want to share with you this recipe which is now part of my culinary repertoire, something which is seasonal, humble and so versatile, as instead of spinach you can also use Swiss chard, foraged herbs or the king of Tuscan winters, cavolo nero. 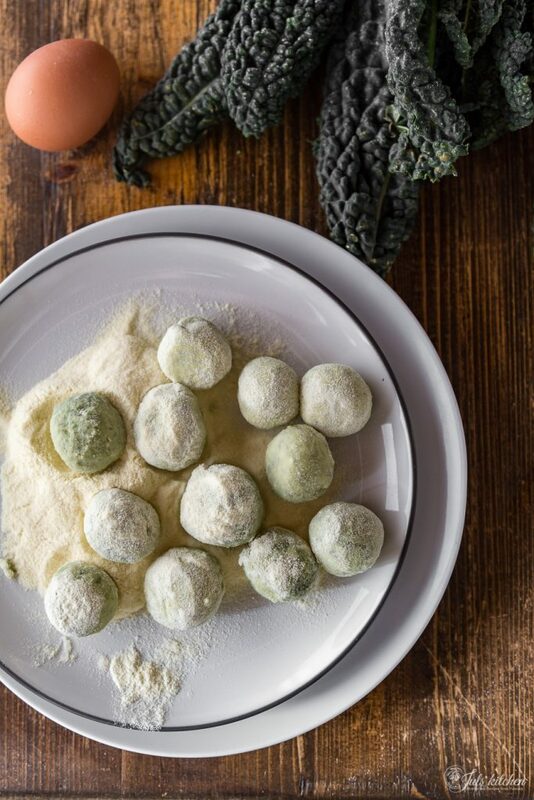 There are two crucial ingredients here which can help you ease the anxiety while waiting for your gnudi to float tot the top: ricotta and cavolo nero, the Tuscan kale. Use a well-drained ricotta and squeeze very well the cooked kale. Once you make this, they will be your next success in the kitchen. Wash the cavolo nero leaves, remove any hard stalk and drain. Bring a large pot of water to a gentle boil, add the cavolo nero leaves, pushing them into the water, and cook on medium flame for about 15 minutes, or until tender. Drain the leaves well, let them cool down and squeeze them with your hands. A potato ricer works magic to squeeze the excess water out of vegetables like spinach, kale and the like. Once the cavolo nero is perfectly squeezed, chop it with a knife: don’t be tempted to use a blender, you don’t want a purée but some texture for the gnudi. Sauté the chopped cavolo nero in a pan with a tablespoon of with extra virgin olive oil and a minced clove of garlic. Scoop in a bowl and let it cool down completely. Collect in a bowl the well-drained ricotta, the cold cavolo nero, the Parmigiano Reggiano and a beaten egg. Add a generous pinch of grated nutmeg and mix thoroughly with a fork. Season with salt. Sprinkle generously a tray with semolina flour. Form the gnudi shaping with your hands balls slightly smaller than a walnut. Gently roll the gnudi in semolina flour, then leave them into the semolina. The semolina creates a film around the gnudi, thus preventing them from melting into the boiling water. You can cook the gnudi as soon as they are ready but if you allow them a few hours in the fridge into the semolina, the flour will absorb their moisture and you’ll have firmer gnudi. In other words, you’ll be sure that they won’t melt in the water. When you’re almost ready sit at the table, bring a large pot of water to the boil and prepare the dressing for the gnudi. Cook the guanciale cut into thin strips and set aside. Melt the butter with the sage until the leaves are crisp, then set aside. Cook the gnudi in batches in boiling salted water. When they float to the top – just a few minutes, sometimes it only takes one – lift them out with a slotted spoon and move them into a serving plate. Drizzle the gnudi with the brown butter and sage, add the crisp guanciale and a sprinkling of grated pecorino. Toss the gnudi with care and gentleness, otherwise you might break them. Serve immediately. 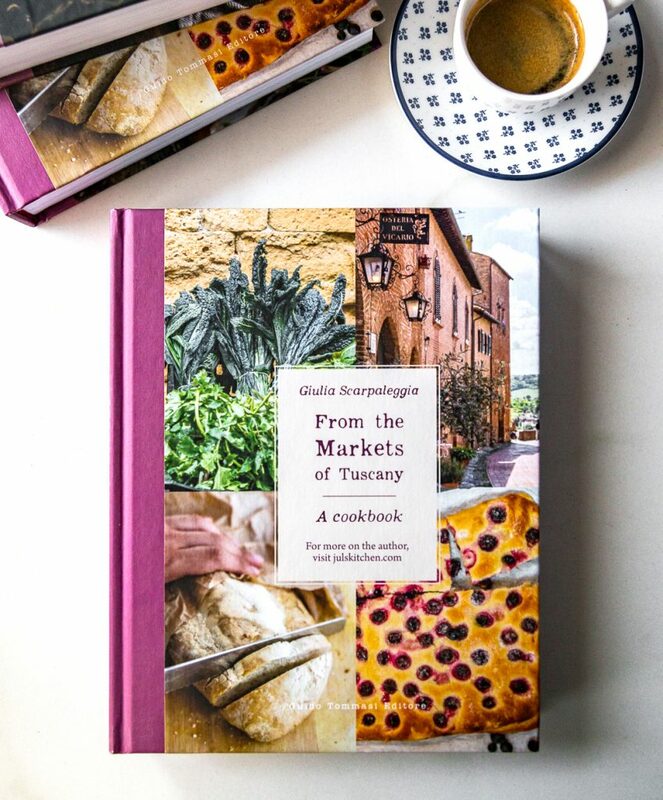 Last year I decided to share these recipes, staples of a Tuscan repertoire, analyzing the ingredients and the process with plenty of details so that, if you want, you’ll be able to include them into your collection and make Tuscan cooking your signature style. After the crespelle alla fiorentina and the eggplant meatballs, after the Tuscan apple olive oil cake that you all loved, it was time to add another main course, the gnudi that brought so much luck to my life. 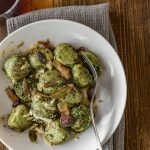 There are many recipes for gnudi here on the blog: spinach gnudi, with some musing about their name, and gluten free gnudi (including a video recipe! ), to name a few. 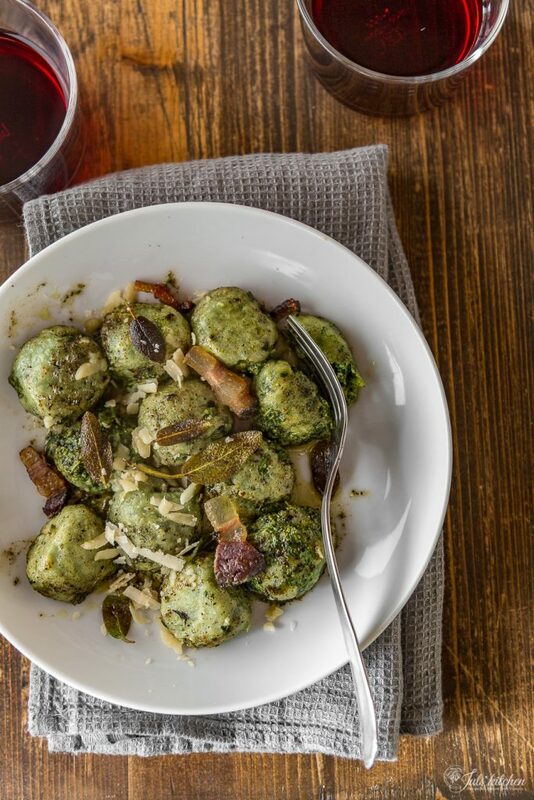 Amy’s recipe for spinach gnudi. Nigel Slater’s gnudi, made just with ricotta, which sound divine. 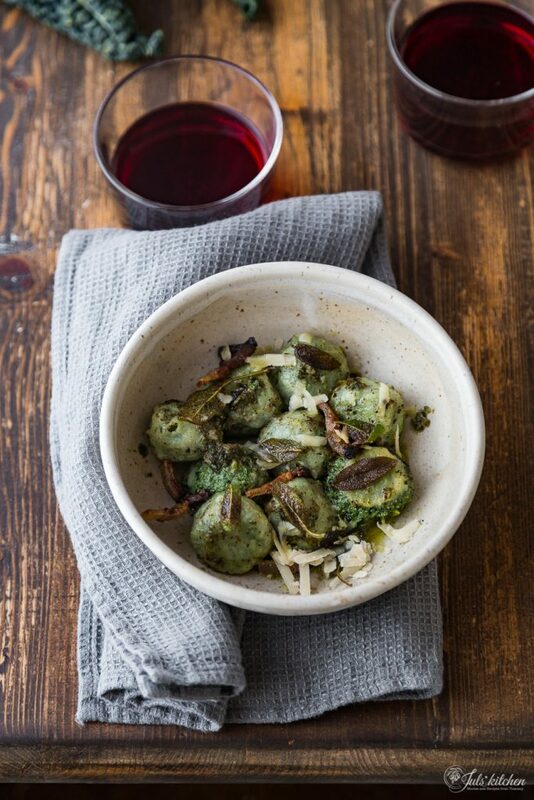 Tuscan kale and chicory malfatti Granda Menna’s Kitchen: malfatti or gnudi Summer awareness and ricotta gnocchi On fifteen hundred ricotta ravioli for our wedding and how to make them. Giulia, I love this story! I feel myself there with you feeling all those heightened emotions. And I love this recipe. My son’s favorite dish is gnocchi. I can’t wait to try this with him and see if he doesn’t love gnudi even more! Thank you. I made this dish last night. Unfortunately, I was not able to find any ricotta that was like the firm kind I remember from visiting Tuscany so I used the paper towel draining technique described in Serious Eats (http://www.seriouseats.com/2015/03/technique-fresh-ricotta-gnocchi-fast.html). I think I should have tried draining the ricotta twice since the result was still a bit too soft. Question to Julia – should I have 300g of ricotta after draining? After boiling and squeezing, my 500g of cavolo nero yielded 100g for use in the recipe. The gnudi managed to hold together. I really like the addition of the sauteed guanciale. previous post: Butternut squash and lamb meatballs. A recipe for you. next post: Citrus marmalade with oranges, lemons, bergamots and citron.